Rewire your senses with Armonite’s release, ‘And The Stars Above’ – Cleopatra Records, Inc. Composer Paolo Fosso and violinist Jacopo Bigi are classically-trained musicians but doesn�t let the title �classical� deter them from experimenting with other genres. The prog-rock duo�s music is described as soundtrack music with immediate textual ties that place them in the forefront of instrumental music. Through their teenage years, both joined a few bands that paid ode to a variety of genres and artists, from the Beatles to Dream Theater. Towards their college years at the end of the ’90s, they formed the band, Armonite. After an album in 199, and a few live sets, the band split up. In 2015, they formed a new band under the same moniker as their former. Once they�ve collected enough material to release an album, they hired Porcupine Tree�s bassist, Colin Edwin and Dutch drummer Jasper Barendregt for the recording that took place remotely. Their debut album was mastered at the Abbey Road Studios in London, and their record, The Sun Is New Each Day, was released in 2015. 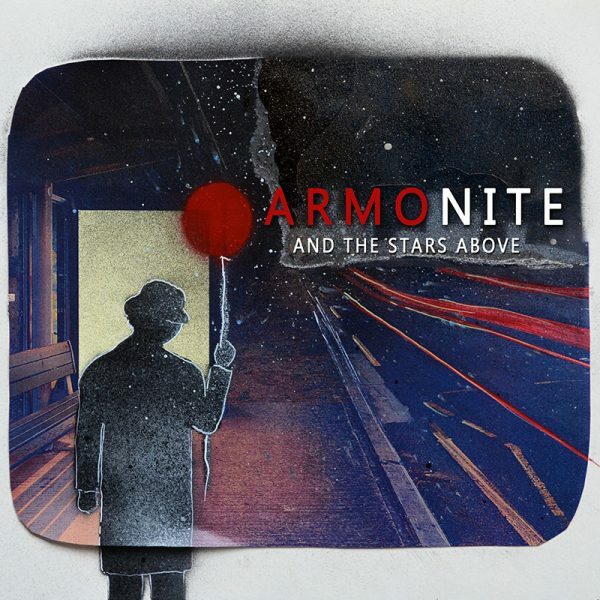 Armonite�s latest offering, And The Stars Above, follows in the same tangent as their prior release. And The Stars Above is a 14-track compilation, including bonus material, that incorporates dreamy soundscapes in the nature of soundtrack music, rendered in a blend of acoustic instrumentation and electronica, released for Cleopatra Records. The album opens up with �The March Of The Stars� that starts off with staccato rhythms coming from the violin accompanied by some ethereal and soaring vocals that creates an altogether out-of-this-world experience. The highly atmospheric sound is filled with ambient waves, buoyed by a soundtrack-like fell. Half-way into the track, the song becomes more energetic with bouncing percussions and the sounds of melodic violins, whirling together into an other-worldly feel. The track is filled with pizazz and an amped feel, heightened by the support coming from the orchestra that gives off a theatrical and operatic appeal. �Next Ride� starts off with some electric electronic beats that carries the song with some soaring synths. Radio-active violins coalesce in the track along with the electronic beats and some lush symphonic strings. An atmospheric sound and ambient vibe could be detected along with fervent feel in the song. �District Red� opens up with the energized plucking of the violin strings that gives an overall thrilling and immediate feel towards the beginning of the track. A gloomy vibe and stormy feel could be elicited on this dark, haunting song. The strings gives this track a disconcerting, ambient vibe, while the clashing of electric violins, drums, percussions, and bass conjures up an atmospheric soundscape filled with a strong sense of urgency and foreboding. �Plaza De Espana� starts off with a highly harmonic piano melody that paves the start of this song, creating some beatific and sweet cadences. Next, the sounds of the strings join in, attaching itself to more of the soothing cadences prevalent towards the beginning of this track. The piano and strings are also accompanied by the sounds of the electric violin giving the song a more radio-active appeal. A peaceful blend of piano and violin create a soaring melody, blended in with electronic beats. �Clouds Collide� begins with some crystalline vocals that creates a spell-bounding performance. The singing is commandeered with a theatrical flair with epic-sounding strings accompanying the vocals as well as a melodic tune from the piano, a coalescing of dreamy and soaring cadences. Mid-way into the track, layers of vocal harmonies overlap to create an other-worldly, ethereal feel. �Blue Curacao� encompasses a range of eccentric-sounding electronic beats that circulate along with the winding sounds of electric violins, as the ecstatic sounds of the violin fully delivers. The energized sounds coming from the strings buoy this track, a soaring and ambient number. An epic violin solo sounds off towards the end with the full support coming from the violin strings. A spell-binding performance. Listeners will become enthralled beneath the cadence. �By Heart� is filled with ambient electronic layers that is the imprint of this song. The track continues on with traces of the violin interceding into the song. The impassioned track is filled with a highly emotional sound, as waves of electronic beats go on to create a piercing and provoking experience. �Freaks� starts off with a haunting piano melody mixed in with some electronic beats. The insistent cadences coming from strings create a careening over-arching sense of urgency. The electronic beats go on to meld an eerie feel within the track, crafting a surreal sense to the song. �By The Waters Of Babylon� opens up with a moody piano melody as lush strings intersect later on, constructing a crisscross of soaring vibes. The song is filled with sweeping grooves with epically rendered details. A melancholy tune could be vied from the piano and violin that casts a slightly nostalgic feel. A choral background paves the track towards the end. �The Usual Drink� begins with an intertwined sound coming from the violin and piano. The somber blend is a sad concoction, filled with gloomy riffs. The trickling in of piano keys and violin synced together cast a melancholy form, but the sound that comes across is disconcerting with what appears to be two different melodies wrapped into one composition. �What�s The Rush?� is jumpstarted by a bit of industrial metal like electronic beats. And together with bass, drums, and electric violin, and mixed in with a blend of euphoric strings is packed with a dissembling of sounds from those that are fully elicited from technological fare and more acoustic oriented instruments. Consisting of a bewildering cadence that is highly atmospheric, the track is paved by fast drums and speedy flaring beats, creating a rummage of busy cadences. �Ghosts� starts off with a dreamy and haunting vibe filled with electronic nodes, a wall of moody violins, and the luster of lush strings. The immediate feel continues on in the following bonus tracks, on �A Playful Day (for String Quartet)� that is rendered with a flirtatious melody coming from the strings and on �The Fire Dancer (for Piano solo),� which is paved by a dancing piano melody filled with a spirited and fiery vibe. Armonite proves they are at the pinnacle of the soundtrack with these wide-ranging tracks that will seize listeners with its atmospheric soundscapes. A welling of sounds, And The Stars Above, encompasses waves of electro flair that demonstrates that the instrumental duo is unafraid to blend electronic beats into acoustic instrumentation. The group merges organic instruments with technological fare to create an enticing electro combination of orchestra and prog rock. A complete electro-orchestra melding, the instrumental band produces aesthetically pleasing and soaring compositions that will dissuade even the firmest non-believer to become avid audiences of the band. Travel to another realm as you traverse worlds to reach to the center of Armonite�s sound, a place, where, with certainty, listeners become believers.